Pinar del Río is the westernmost province of Cuba, also called the green province, a gift of nature. Tobacco is grown in its extraordinarily fertile lands and valleys. This tobacco is used to produce the Habanos or Cuban cigars, the best in the world. The province has two mountain ranges. One of them is the Sierra de los Organos, of great geological interest, including the Viñales Valley with its mogotes or pincushion hills, and many caves, including the Indian cave and the Santo Tomás cave system. Viñales is the ideal place for walking, hiking and watching local autochthonous species. 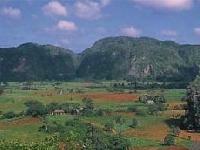 Several hotels and restaurants service Viñales area. The other mountain range is the Sierra del Rosario, which is considered natural reserve of the biosfere and one of the oldest mountain ranges in Cuba. There you will find the Soroa lookout point, its orchid garden and the waterfall. Soroa has been called the raibow of Cuba. Not too far away is located Las Terrazas, a touristic complex that includes La Moka hotel and a unique farmers community. In the coasts, virgin keys and submarine paradises attract every year thousands of tourists, avid of contact with nature, away from crowded cities.